It is tough enough seeing a young person battling a serious medical condition, but what if you have to fight tooth and nail to ensure that your child receives the life-changing medicine they need? Unfortunately, that’s the predicament that the parent’s of 7-year-old Stefan Starostecki find themselves in. Their young boy was diagnosed with epilepsy when he was just 10-months old. They’ve pursued and exhausted a range of conventional medical options in an effort to alleviate his daily convulsions. For example, they tried traditional pharmaceuticals and they have given several highly invasive surgeries a try, too, but none of the standard treatments have helped. In desperation, Stefan’s parents decided to try something really unconventional — medical cannabis — after they began hearing how other juveniles with epilepsy were being helped by the herb. Amazingly, as you can see for yourself in this extraordinary video, that cannabis contains compounds that are somehow able to stop Stefan’s seizures in their tracks. This is how fast cannabis oil stops a seizure. We moved to Maine so we could legally make the only medicine that controls and stops our son Stefan's seizures. (The alarm you hear halfway through the video is his seizure monitor) Stefan uses CBD twice a day, but this particular oil is THC I'm rubbing into his gums….and our town council of Standish wants to ban cannabis on Tuesday! Stefan’s father, Peter, shared this remarkable video on Facebook to show “how fast cannabis oil stops a seizure.” As you can well imagine, Peter and his wife must have been incredibly relieved to find a treatment that helps put an end to Stefan’s convulsions. However, the family has still faced considerable challenges when it comes to getting Stefan the only treatment that seems to offer relief. To begin with, the Starosteckis lived in Florida when Stefan was first diagnosed. At that time, the Sunshine state had failed to pass a medical marijuana referendum, which might have given epileptic patients like Stefan access to medical cannabis. In fact, Florida only began allowing medical marijuana in November of 2016 and its policies are still considered inadequate and restrictive by advocates of medical cannabis. As a result, Peter’s parents felt they had no choice but to move to a state that offered access to medical marijuana. They choose Maine because that state’s program had been in existence for 20 years and offered (they believed) the best and most advanced medical marijuana program in the country. I talked with Stefan’s father, Peter, for this article in order to better understand the difficulties he and his family have gone through, and also to gain insight into how cannabis is helping their son. First, the good news. Both CBD oil and THC oil make a dramatic difference in alleviating Stefan’s seizures. 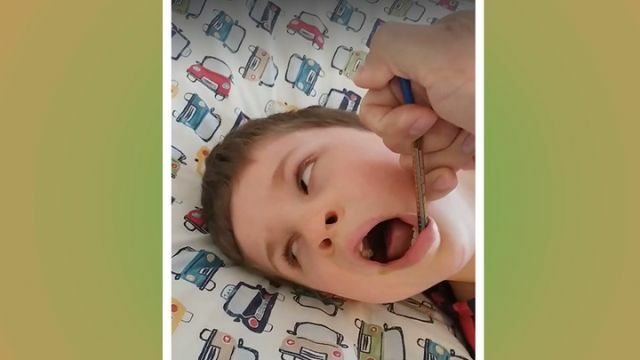 The family gives Stefan CBD oil twice daily to help to manage and lessen the severity of his seizures, but they also use THC oil, which can halt his seizures almost immediately after they rub the oil on his gums. You might think that clear evidence that CBD oil and THC oil mitigate Stefan’s convulsions would be enough to overcome resistance to the idea that marijuana can be medicine. Sadly, Stefan’s family still confronts numerous challenges in getting the only medicine that has helped him progress. For example, Peter explained to me how he had to quit his job just so he and his family could move to Maine, which supposedly offers better access to medical cannabis. However, the Starosteckis still face formidable obstacles. As Peter told me, Maine’s voters approved a measure legalizing marijuana for recreational purposes, but the state’s governor, Paul LePage, has vetoed the very legislation that citizens approved last year. Consequently, marijuana is technically legal in Maine, but you can’t go to a retail store and buy it. As you might expect, this creates a huge problem for many patients because they are forced to rely on shady sources to procure their supplies. Therefore, getting cannabis that is free from mold or impurities is very difficult. The legal quandaries also make it really hard to get cannabis with a known dosage, which is also a really important consideration for patients. To compound matters, the Starosteckis live in a town called Standish, which wants to ban cannabis locally on Tuesday. Peter explained to me that he is on the Town Council, but as a relative newcomer he’s perceived as something of an outsider. Fifty-four percent of the town’s residents are with him and his family (they support allowing medical cannabis). But Peter says that some officials remain very hostile to the idea. One hopes that they will at least watch the amazing video of how cannabinoids help Stefan. The scientific evidence is overwhelming that cannabis is both safe and effective when it comes to helping you people with epilepsy. You’d have to bury your head in the sand to ignore this truth. Hey Buddy!, I found this information for you: "Watch How Medical Cannabis Instantly Alleviates This Boy’s Seizures". Here is the website link: https://www.thealternativedaily.com/watch-how-medical-cannabis-instantly-alleviates-this-boys-epileptic-seizures/. Thank you.